Introduction to the translation and analysis of Thomas Aquinas’ writings relating to the Christian doctrine of tongues. Aquinas wrote considerably on this subject. His synopsis answers some very important questions on the ecclesiastical history of tongues from the fourth century onwards and how the definition finally began to shift during his own period. Thomas Aquinas lived from AD 1225 to 1274. He “was an Italian Dominican priest of the Catholic Church, and an immensely influential philosopher and theologian,”1 His methodology, and analytic approach from a Greek philosophical framework has highly influenced later scholars in almost every field. When reading Aquinas’ works, one comes up with a multiple of conclusions about Aquinas himself. He can be perceived as a brilliant free-thinker well versed in the Bible, deeply entrenched in personal piety, willing to use literature outside of the Bible, especially classical Greek writings, and very systematic. However, he sometimes comes across so systematic that it appears very dry and terse. “Saint Thomas Aquinas is a paradox. He was a mystic and a rigorously scientific theologian. His attachment to Judaeo-Christianity was strong enough for him to appreciate and appropriate pagan truths. An Aristotelian, he never ceased utilizing Platonic insights. In him a deep reverence for the Church Fathers was coupled with an astonishing zest for novelty. All of these cross-currents were to show up in his biblical exegesis. He was neither an Alexandrian nor an Antiochene, perhaps because he was both. No one has successfully categorized his approach to the Bible. Even with these many conflicting sides of Aquinas present, he was innovative in his time for the comprehensive and systematic nature of his approach. However, innovative in the sense of proposing new doctrine would not be a proper description. He was a traditionalist and not a maverick. His Lectures are an intense work of faith on the one hand, but on the other, it often appears as a limited hermenuetic of the Bible with little or no reference to critical analysis. The methodology contains a comprehensive overview that focuses on the multifaceted nature of this issue. It goes far beyond tongues as a heavenly, ecstatic or human language. One of the problems of the tongues controversy are generalizations with few documented examples. This is why so much time and effort was made on translating the majority of his works relating to the gift of tongues. This study intends to find seven aspects to the nature and evolution of the definition. First of all it is to determine how Aquinas defined the mystery of tongues. Secondly, did he separate the tongues of Corinthians from that of Pentecost? Were they the same or entirely different entities? Third, to see if he attempted to rectify the Nazianzus paradox of it either being miraculous speech, or a miracle in hearing. Fourth, what arguments, disputes or disagreements on the subject existed during his time. Fifth, to analyze if his writings demonstrated the doctrine of tongues shifting into the prophecy definition. This becomes more important in the later definition of tongues between the Reformation and early 1800s. Sixth, to find his definition on the office of tongues in the Church liturgy. This is important for tracing the office of the public reader (which initially was connected with the gift of tongues) and how it evolved over the centuries. Seventh, to understand the concept of unknown tongues as was used in his texts. What did he mean by it, and how did it possibly influence later thinkers and translators. This series, along with all the other ecclesiastical writers on the subject, is intended to provide the texts in the original language, along with an English translation and analysis. This is to counter the over-generalizations and lack of scholarship that has so badly scarred and misdirected issues surrounding the Church doctrine of tongues. The translations are based on the printed version found in S. Thomae Opera. Roberto Busa, S.I. ed. Fromman-Holzboog. 1980. There is an almost identical web version available at corpusthomisticum.org. The I Corinthians document is in a form of captured lectures supposedly by Aquinas, known in Latin as Reportationes. The Lectures on I Corinthians is composed of three different texts. Chapters 1 to 7:10 are considered very close to Aquinas style but no details are further given. Chapters 11 to 13:11 are recorded “by St. Thomas’ intimate companion and friend, Reginald of Piperno.”4 The actual mention in Busa’s publication is called RIL; short for Leonine text. Next is the Vulgata Copiis which overlaps going from chapters 11 to 16. The Gift of Tongues Project is concerned more about the dating of a text than the actual authorship because the intention is to trace the evolution of a thought from inception to its final course. Aquinas is viewed not so much as the individual man, but a point of thought in the stream of time, and how later followers interpreted and passed the Aquinas perceived version of the doctrine over to the next generation. Judging by the copious use of Scripture being cited in the Stephanus format, ie: Eph. 2:2, which didn’t become part of the Bible until the 16th century, the manuscript is not a very old one and must be dated the 16th century or later. This does affect the conclusion as the Lectures do conflict with that contained in Summa Theologica. This discrepancy is addressed in the conclusion of this series. The tongues subject matter was first found via Busa’s thorough index. From the index, I was able to find the most valuable resources on tongues. There are numerous English translations available on Aquinas’ works on Summa Theologica but only one is popularly found on I Corinthians — Fabian Larcher’s unpublished translation on I Corinthians. It has been posted at Ave Maria’s website in a non-critical edition, with hopes that the centre will improve it to a final form. Larcher’s introduction to the English world with the works of Aquinas is massive. However, for the purpose of this tongues project, it is always necessary to check the source works, because many translations are old and lack contemporary English, some are abridged or condensed, and others did not pay much attention to the tongues passages for language equivalents, Larcher’s work could not be considered de-facto. Also, being forced to translate an original work always gives the researcher additional clues often overlooked. Larcher’s work is good, probably better than the following one provided by myself. However, this work does consult Larcher frequently, improving on his translation in some areas, while going on a separate route on others. For example, Larcher provides the translation for imaginarias visiones as imaginary visions which is a literal translation but directs the modern English readers mind into a wrong definition. The proper translation and the reasons behind it can be found by reading the following article: Thomas Aquinas on the the Prophet and Imaginary Visions. 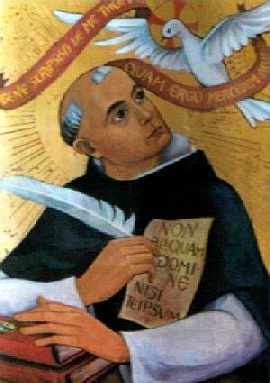 Aquinas liked to structure all his thoughts by breaking them into two, and at the most four reasons, to explain any passage in detail. He utilized this structure quite frequently. His lectures, or in Latin, Reportationes, is also like one long stream of endless words. The sections are very long and do not include any sub-titles or verses. This may be only a problem related to the way the printed edition was typeset and formatted, but it initially appears large and overwhelming. Aquinas rushes the reader with every sentence and every word. He changes thought very quickly with no segue to the next concept. One paragraph can easily contain 10 or 20 deep, intellectual or complex one-liner ideas that challenge ones Biblical and philosophical familiarity. Consequently, none of his works can be read in one sitting. Evangelical readers will find Aquinas style and structure very similar to their traditional protestant Bible commentaries. Aquinas had a strong preoccupation with defining the Christian faith through a classical Greek framework. Therefore, there are certain key-words that must be understood especially in his lectures on I Corinthians. Three of them especially stand-out, intelligo, scio and cognitio. The word intelligo is meant to mean simple understanding of facts, scio is to know something through practice, experience or ability, cognitio is a far more intimate knowledge of a person or thing. It is the Greek equivalent of gnosis which in the Christian tradition is a type of knowledge that changes ones perceptions and decision making processes, resulting in transformation, personal growth and changed behaviour. It is the prime impulse that motivates ones Christian life and witness. This whole subject was dealt with in a previous work, Origen on the Gift of Tongues. Aquinas’ use of Cognitio is interesting because it is used more frequently as noun rather than its verbal form, cognosco. It is a state rather than an action that must be pursued. It is very difficult to translate these nuances to the modern English reader. I don’t think neither myself nor Larcher are entirely successful in rendering this properly to the English reader. It needs more work. Interpreto, this noun is typically translated as interpreted; which is communicating one language to another. However, Aquinas adds this literal definition with a spiritual sense. He thinks interpretation of divine things, including that of any ecclesiastical tongues, to be the function of the prophet. Interpreto in this mode does not simply mean to interpret language, but requires mental comprehension of a divine infusion. Therefore in the spiritual sense, understanding is sometimes necessary to use as English equivalent rather than interpret. Then there are the words: imaginarius,imaginarius visiones, imaginatio, and imaginativus. These are covered in two separate articles; Thomas Aquinas on the Prophet and Imaginary Visions and Aquinas on Imagination Part 2. Another important word that appears typically in this portion of Aquinas’ text is lingua. It is translated in the following copy interchangeably as language or tongue.The English translation of this word is controversial and has been covered in a previous article, The Difference Between Language and Tongues. Past research has clearly defined these words as synonyms meaning foreign language and has been applied this way. Another word that is frequently used in Aquinas’ works is the adverb scilicet: “namely, certainly, in fact, of course, clearly etc.” It is very repetitive in Aquinas’ works and so I have tried to use different English equivalents in repeated sequences to avoid reader fatigue. Thomas Aquinas assumed a high level of Biblical literacy on behalf of the reader. It requires a thorough, if not, a complete mnemonic knowledge of all Scripture. In the original Latin, he briefly cites a passage, sometimes only two or three words, assuming that the Christian reader can fill in the blanks where necessary. There are three ways to identify he is citing a verse: first of all, at least in the Busa edition and Corpus Thomisticum, they have included the Bible reference before a verse, ie: Num. 10:5. This is the most obvious identifier. Secondly, if this is not the case, the verse can be found in the printed edition by a special typographical mark that looks like a footnote resembling the letter o. Last of all, it is frequently preceded by the adverb ibi. This scant reference to Bible verses and such a high assumption of Bible knowledge can easily lose the modern English reader trying to understand his works. Fabian Larcher overcomes these predicaments by including full verses instead of two or three words. He also cites the complete Bible passage at the beginning of each section. This is not part of Aquinas work in the Latin, but makes it much easier to follow for the English reader. He also put the Bible verses after the Biblical citation which is correct for the typical English reader, but the verse citations are actually placed before in the Latin. My translation sometimes puts the verse before and other times after the Bible quotation, depending on what makes best sense to the English reader in that specific construct. To be accurate to the original printed Reportationes publication, I have not expanded the Bible passages nor put the complete Bible passage at the beginning of the section. The verse numbering system that Larcher has invented for his English translation is a good idea but due to time constraints, it is not included it in my own translation. There is a complete typeset Latin copy of Reportationes (His lectures) included with this project’s translation which is also available at a link shown below. The Latin data entry and proof-texting was done by me personally and there may be a slight chance of errors. This is here for convenience. If one is on a critical point, it is best to go to the web version available at corpusthomisticum.org. A comparison of the modern Vulgate compared to the Aquinas manuscripts demonstrates very few critical differences. This is unlike most historical Latin Ecclesiastical texts which typically have a serious amount of variances from the Vulgate. This stimulates an important question that must be asked. Are these Bible citations in Aqulnas’ text a corrected or amended version from the 16th century as well? I do not have an answer for this. Summa Theologia is not included in the Latin copy because it is already popularly available. An external link is given below. 8. A list of Aquinas texts relating to tongues. Here is a complete list of translations and commentary being pursued on this project. http://en.wikipedia.org/wiki/Maimonides I have not substantiated this claim but I would lean more towards this claim than against it. Aquinas Centre for Theological Renewal un-named pdf.